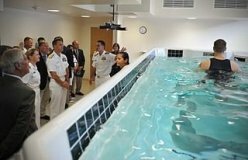 Hydrotherapy Exercises such as floating, general body movements, stretches, and walking in water are beneficial, as water's natural buoyancy allows freedom of movement without jarring or straining the body. Its natural resistance encourages strengthening of the muscles, and its unique properties alleviate pain and facilitate improved health. Hydrotherapy also known as water physical therapy and aquatic physical therapy is the use of a water environment to carry out exercise whilst being able to change the intensity of the movement- a feature which is not possible out of water. 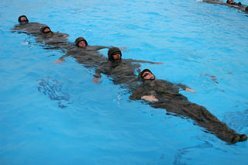 Because the body is buoyant, the water allows for more exercise to be carried out than on land, while the increase in temperature and pressure encourages circulation and flexibility. This is a particularly effective and comfortable way for patients to rehabilitate from a sports injury. The pool itself is specially designed to cater for hydrotherapy treatment. Namely, the water temperature is hotter than the average swimming pool, with temperatures at around 35 degrees the norm to allow patients’ muscles to relax and promote movement. The water in the pool is warm, and is maintained at 33–37°C. Father Sebastian Kneipp, a 19th century Bavarian monk, is said to be the father of hydrotherapy. Kneipp believed that disease could be cured by using water to eliminate waste from the body. 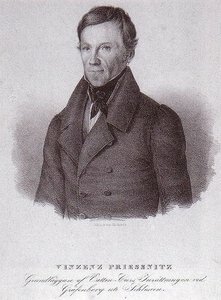 Drawing of Vincent Priessnitz (1799-1851), supporter of hydrotherapy and founder of a spa. Warming up before exercising prevents muscle strain and injury. Submerge your body and allow your muscles to relax, then walk in the water for five minutes to get your circulation flowing. Spend another five minutes stretching while standing in the water, holding each stretch for 10 seconds. Begin with stretching your legs -- thighs, hips, calves, shins and buttocks. Move on to stretching your back, chest, and torso, then roll your shoulders and your neck. Stop at any point that causes pain. After you complete your workout, perform the same stretches, holding each for 20 seconds, before leaving the pool. Using a flotation vest or aqua noodle to keep you upright, perform aerobic exercises for five to 15 minutes. Walk or run backwards and forwards or do jumping jacks or dance moves to elevate your heart rate. If you begin to feel weak or dizzy, rest for a moment or change activities. Sitting or standing in the pool, gently move each joint through a complete range of motion, repeating three to eight times as tolerated. Begin with your shoulders by reaching your arms forward and upward, then out to the side. With your arms below water level, make small circles, then larger and larger ones, first inward and then outward. Bend your elbows, then straighten your arms. Turn your wrists in circles, then bend them forward and backward. Touch the fingers of one hand lightly against the thumb. Make fists with your hands, then straighten the fingers. Sitting in the pool with back supported, straighten your knee and bend the ankle, pointing the toes. Curl toes down, then straighten them out. Circle your ankles, clockwise and then counter clockwise. Slowly raise one foot up to straighten out your knee, then bend the knee again. Lift one knee and hug towards your chest, hands under the thighs or over the knee to assist with the stretch. Sitting forward, straighten one knee and slowly move the leg out to the side, hold for three seconds, then bring it back to the centre. 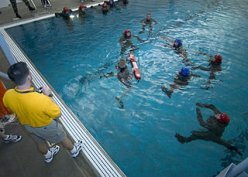 Standing with your left side to the aquatic physical therapy pool wall and holding the wall with your left hand, raise your right leg forward with the knee straight, hold for five seconds, then swing the leg backward. Raise leg forward again, swing it out to the side, hold for five seconds and cross it in front of your body. Repeat with the right leg. Place hands on hips and, without moving your feet, bend slowly toward the right, then to the left. Repeat in the other direction. If you are pregnant or have heart disease, consult a doctor before taking a sauna. When a condition is recurrent or persistent, please consult your physician to determine whether a physical therapy of this type is suitable in your case.